Kanye West took to Twitter on Wednesday to apologize to Drake and address their feud. "Sending good energy and love to Drake and family and crew," the "Gold Digger" star wrote alongside a screenshot of Drake's stage. "I haven't seen the show in person but the images look incredible online I understand where the confusion started." His mea culpa also included an apology for "stepping on your release date in the first place" and noted that the two had been "building a bond and working on music together, including squashing the issues with Cudi at our office. He also admitted he had been "a bit ramped up doing 25 tweets a day" at the time and that "TMZ happened shortly after." "Because we spoke about doing Lift Yourself together I should have given you the opportunity for us to do this together before I released it," he later added after boarding a plane, citing the track he released in April. However, the drama seems to be about more than the track's release. According to fan theories, Drake played his song "March 14" for Kanye before debuting the song on his new album Scorpion, which he dropped in May. Music lovers will recall Drake confirmed he had a son on the track. But before Drake could release Scorpion, Pusha T dropped two diss tracks, including "The Story of Adidon" in which he outed Drake for having a child. As a result, many wondered if Kanye, who partly produced Pusha T's new album, played Pusha T Drake's song. However, the Yeezy head shut down those rumors during his Twitter spree. "Since we were building as friends and brothers I should have spoken to Pusha about the Quentin Miller bar. There should have been no songs with my involvement that had any negative energy towards you," he wrote. He then added, "I never listened to either diss track that followed but I did hear quotes from both songs after they were released." "I did not have any conversations about your child with Pusha," he continued. "I don't play with the idea of people's children after I spoke to Wiz a few years earlier." "I understand Pusha's issues as a man if someone mentions your fianc men go mask off," he continued. "I've done the same myself at times. I love you and I love Pusha and we all have an admiration for each other's craft." 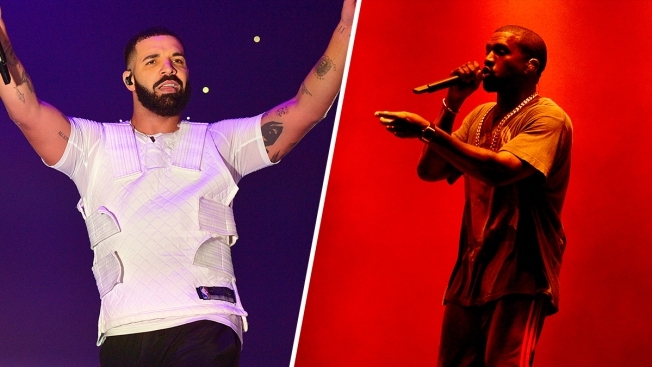 But did Drake throw shade at Kanye on his own track? One Twitter user sent the internet into a frenzy after he claimed Kim Kardashian was "Kiki" in Drake's hit "In My Feelings." The social media user also claimed "Drake's been telling us for months now he slept with Kim K;" however the Keeping Up With the Kardashians star shut down the rumors by writing "Never happened. End of story" in the comments section of a video discussing the fan's theory. In the end, it seemed like Kanye is ready to end the feud. He even claimed he would be attending one of Drake's concerts in the next week to "give love and be inspired by the art you have created." We'll just have to wait and see if Drake accepts Kanye's apology.